If everyone on the northwest side of Chicago who claims to have hung out with the Buckinghams during their heyday had faithfully bought all their releases, the rock group might have sold more records than the Beatles. A popular attraction while still in high school, the quintet changed its name from the Pulsations to the Buckinghams to reflect the British Invasion craze and signed with Chicago's USA Records in 1966. 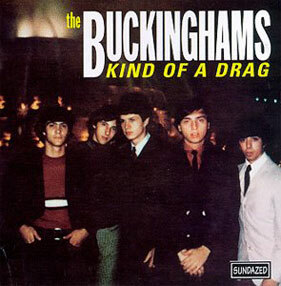 Backing Dennis Tufano's buoyant lead vocals with prominent harmonies and punchy soul-styled brass, the group came across the wistful "Kind of a Drag," and in short order, the Buckinghams had a million-selling pop chart-topper on their hands. They quickly graduated to recording for Columbia. As long as songwriter Jim Holvay supplied more material of the same high quality as "Kind of a Drag," the Buckinghams were sitting pretty. Holvay cowrote "Don't You Care," "Hey Baby (They're Playing Our Song)," and the pseudo-psychedelic "Susan"; each proved to be a major hit for the band. The group's R&B roots surfaced on a vocal arrangement of Cannonball Adderley's jazz standard "Mercy, Mercy, Mercy," their second-biggest hit. The Buckinghams' fortunes, however, soon changed drastically. Although amonst the top-selling rock groups of 1967, they managed only one hit after early 1968, and had disbanded by the end of 1970. Two of the original members, guitarist Carl Giammarese and bassist Nick Fortuna, have since revived the Buckinghams for various oldies tours.